Like many of you, I awoke this morning to the news that nine people had been murdered at Emmanuel AME Church in Charleston, South Carolina. 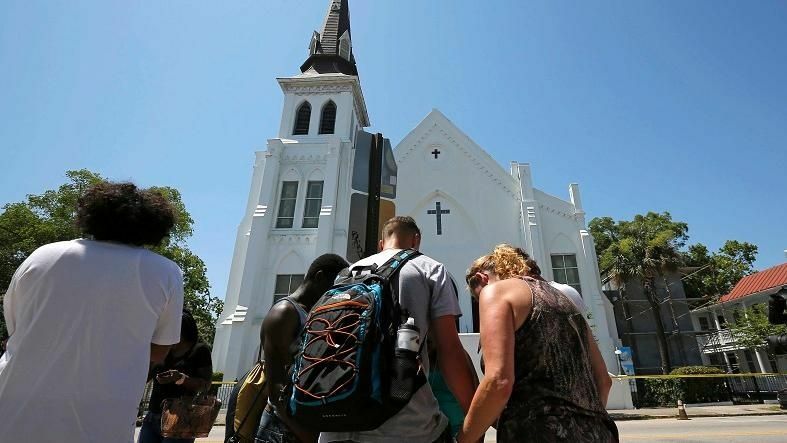 I recall visiting this historic “Mother Emmanuel” church during a vacation I took to Charleston in 2012 to visit the Old Slave Mart museum there. In light of last night’s violence, my immediate thoughts are that there will no doubt be those who will endeavor to politicize what is both a personal and national tragedy, and spin it as yet another “gun control” issue when, in fact, it is nothing of the sort. Lest we forget, a gun is an inanimate object. Meaning, it is completely lifeless. Lay a gun on a table and it will not move from that spot unless influenced by some external force. It’s Physics 101. A gun cannot pick itself up. It cannot load its own ammunition. It cannot, on its own, point its barrel at anyone and pull the trigger with the intent to hit its intended target. A gun possesses no inherent capacity to act autonomously with any degree of logic, reason, purpose or forethought. As with anything that could potentially be used as a weapon, be it a rock, a stick, a fist, a bomb, a shoe or whatever, a gun is wholly incapable in and of itself of contributing to any act of violence apart from the volitional intent of the person who determines in his or her heart to use such an object for their own destructive purpose. Inanimate objects like guns do not produce feelings. They do not self-generate motive or intent. The reason they do not is because they cannot. Only human beings are so emotive as it is we alone who are possessive of hearts through which such intentions and motives are borne and, for better or worse, are subsequently acted upon. There will be those who will say that this is a “senseless tragedy.” No, it’s not. In fact, as sad as it is, what happened in Charleston makes absolutely perfect sense when viewed through the paradigm of what God’s Word says about our innate spiritual condition. Like any crime that is committed, not to mention any murder, what occurred at Emmanuel AME Church happened only because the alleged perpetrator, out of the evil which he himself allowed to take up residence in his heart, intentionally and deliberately purposed to use a gun to murder nine human beings. What prompted this person to murder nine individuals he did not know, is no different from what motivated Cain to murder his brother who was his own flesh and blood – and Cain didn’t use a gun. There are reports that the massacre at Emmanuel AME Church is being investigated as a “hate crime“, a term to which I personally do not subscribe because I believe it to be redundant. All sin originates in the heart. You see, “gun control” apologists do not grasp the fact that at the heart of what transpired in Charleston is, ironically, the heart. Biblically speaking, it is entirely possible to murder someone without laying a finger on them. Why? Because murder is an attitude before it is an action, and that attitude has its genesis in the heart. We should not expect an unregenerate world to understand this. Those who do not know Jesus Christ as Lord and Savior will, in the futility of their minds, continue to search in vain for human solutions to what is, and has always been, a spiritual problem. May the sovereign God of the universe comfort and strengthen those affected by these shootings and may He be glorified as they seek Him during this time of great difficulty. Next postThe Big Question: After the Confederate Battle Flag Comes Down, Then What? If you want a good understanding of the incident in S.C., the blog will give us all what we need to understand from the Scriptures, what is going on. I might add, that it’s persecution of the saints of God. What an absolute breath of fresh air! Would to God that everyone who knows the truth that’s only to be found in Christ Jesus, would so clearly codify sin and scts of evil in our world, as brazenly accurate as Darrell has so done here, by the grace of God. His well-articulated insight rests wholly on the authoritative teaching that’s clearly pronounced in God’s written word, The #Bible. Leaders in the churches, take heed, and receive the #Truth. Then live it and teach it, so Christ and His kingdom are magnified in the world, at such a time as this. LORD God, bless all who hear and obey Your revealed truths!